Anzac Day Prayer by Rev. Donald Howard. Camden RSL Sub Branch Chaplain. Almighty God, who alone can provide strength for us at all times, give us grace to meet our needs; courage to defend the weak; the willingness to serve our fellow citizens and the ability to fulfil our duty in peace and in war to the glory of your Holy Name, through Jesus Christ our Lord, AMEN. Camden Remembers offers a glimps of Anzac Day in Camden with photographs, Addresses of the day and the Anzac Day Shield winning essays. Every year in Camden thousands show their pride in Australia by turning out for the Anzac Day March and Services to remember all our brave Service Men and Women who gave so much of themselves for us and our country, especially those who made the ultimate sacrifice. 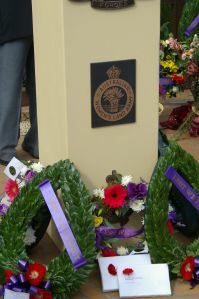 Each year the crowds grow as more and more attend the very moving Dawn Service at the RSL Memorial Rose Garden and later in the morning line the full length of Argyle Street to cheer on, encourage and thank the veterans who proudly march to the Memorial Service at the Bicentennial Equestrian Park Memorial. A great sign that in Camden We Will Never Forget. For a few years now Camden RSL Sub-branch has invited students from the local Primary and High schools to write an essay on What Anzac Day Means to Me. The winning essays are read by the students at the Anzac Day Service in Camden. The students are presented with a small cash prize and the Anzac Day Shield which their school retains until next Anzac Day.